The father of the two toddlers ages 4 and two, told deputies his children were not returned by their mother (Iman Milner FB/10-17-90), after her scheduled unsupervised visit. The visit was scheduled for 5/29/18, between 10:00am -4:00pm. Several attempts have been made to locate the children and Ms. Milner. Ms. Milner may be driving an older model Mercedes Benz, Black in color, with unknown paper plates. 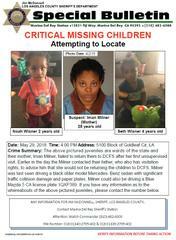 Both children and the mother have been entered into the law enforcement Missing/Wanted Persons system. The investigation is on-going. Anyone with information about their whereabouts are asked to contact Marina del Rey Station Detective Bureau (310) 242-6200.